Multiple ligament knee injuries, although rare, are severe injuries because they result in the loss of the passive and active knee stabilizers as well as often compromising neurovascular structures. Treatment of these injuries is controversial, and results after surgery are often poor. Because of the multiple ligament disruptions, the knee is at a biomechanical disadvantage. Surgeons performing reconstructions in patients with these injuries must have a complete understanding of the normal anatomy and biomechanics of the knee to optimize the timing of surgery, the order of ligamentous reconstruction, and the anatomic placement of grafts. This chapter outlines the osteology, the ligamentous stabilizers of the knee, the menisci, and the neurovasculature of the knee. The biomechanics of the knee are detailed by describing the roles of the anatomic structures and their relationships in the uninjured knee. In addition, commonly used grafts and surgical approaches are described. 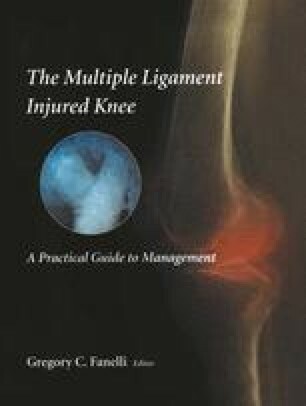 This knowledge is critical to surgeons attempting reconstruction of the multiple ligament injured knee.